I have created my own free RPG directory to keep track of all the free RPG stuff I find. It's based in the Delicious social bookmarking system, so will have loads of features. Also, I bring forth news on Farsight Games gush of free output, the free RPG community at 1KM1KT throbs into life and Viking Midgard gets a post-review update. I've been working through my favourite free RPG directories and picking those RPGs that I believe will satisfy your thirst for free roleplay goodness. For every review, I read three RPGs and click ten links. For each 'not found' page, I shed both a tear and a piece of my soul (why do they not upload to 1KM1KT?). I'd like not to be put through that horror but shredding my soul is part of my job here on the free rpg blog. To shield you from that emotional hardship, I have created another RPG Directory. As if we didn't have enough. Browse the links by tag, for example fantasy. Add thefreerpgblog to your network. 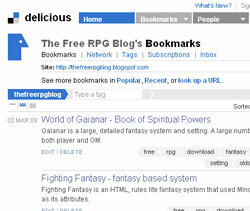 Let me know of something you've found by adding a link with the tag 'thefreerpgblog'. The Directory is also on the blog! You can see the latest links on the left hand side (under the twitter feed) and a link to the directory in the header. Farsight Games has gone content mad! 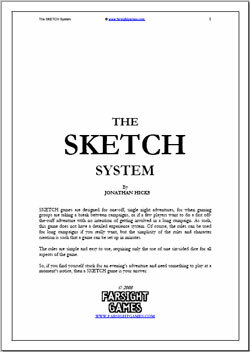 Jon Hicks, over on Farsight games has been busying away with new settings for the Sketch system. A delightful flood of free RPG goodness. A post apocalyptic setting, The 13th Year, dark fantasy Darkland and Highlander (as in the film. You know, the the Good One). They all look smashing and have been added onto my list. If you can't wait, then Unclebear is also feeling the Sketch love. If you're not feeling the Sketch love, then give it a try. Also, I filled in a review for a future free ODDS ezine. For a raving egomaniac, that's a dream come true. One Thousand Monkeys Back to Life! 1KM1KT by Keeton Harrington is a free place to host your games and has a little community of philanthropists. I'm pleased to announce that the 1KM1KT Community has bubbled into life once again. We're plotting a 24 hour RPG competition in the near future. If you're into your free RPGs, then come on over. 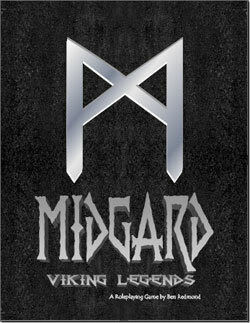 Ben Redmond has been furiously updating his Viking RPG, Midgard, since my review. Most of the changes are a result of a good playtest - not as complete as Ben might have liked but worthwhile nonetheless. He has made a print version, as suggested by David Macauley in the comments of my review, tightened some of the rule description and improved some of the rune player handouts. I've had a quick skim read and although there still is no setting (Gah! Please, Ben, make a nice setting, you know you want to), the rules now feel like something has been playtested and polished, rather than brain-farted onto the page. Great work, Ben! Let's all hope his break from developing Midgard is a short one. Added to my del.icio.us network. Also, I'll be sure to check out Sketch. Sounds interesting.